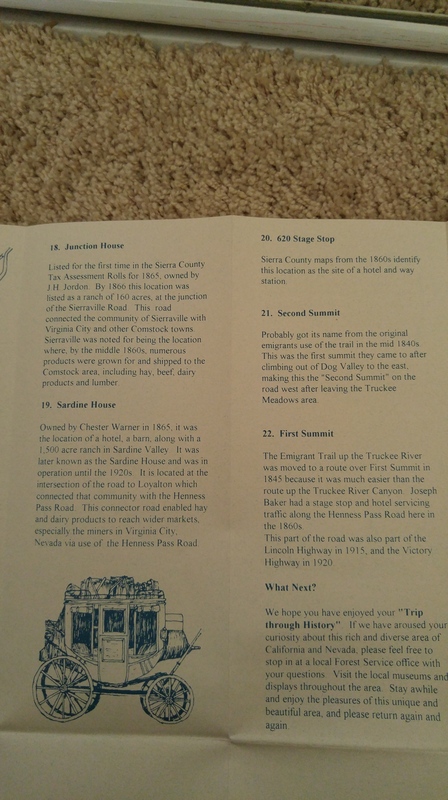 I have photographed each section of the brochure and uploaded it to assist with your planning (see the bottom of this post to cut straight to it). Unfortunately, the numbers in the brochure correspond to very few easily identifiable locations on the ground as most of the markers are no longer to be found. 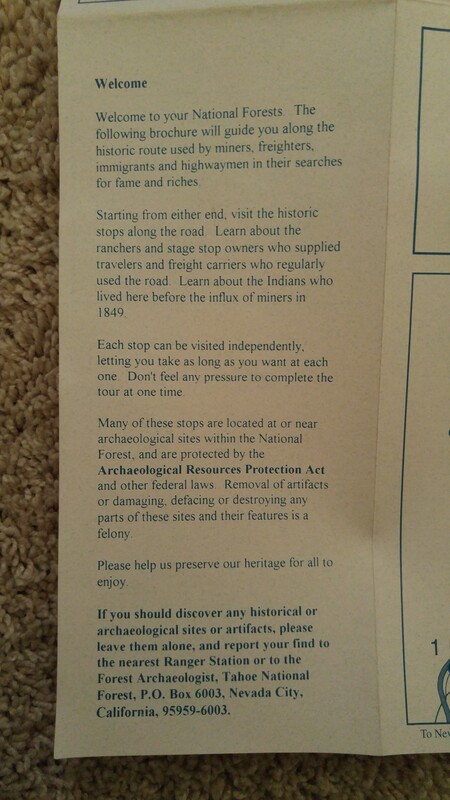 However, presumably, with the assistance of the brochure, one can identify these sites before departing. For example, if one utilizes one of the online topographic maps, the GPS coordinates for the sites of interest along the way can be plugged into a GPS unit prior to your departure. 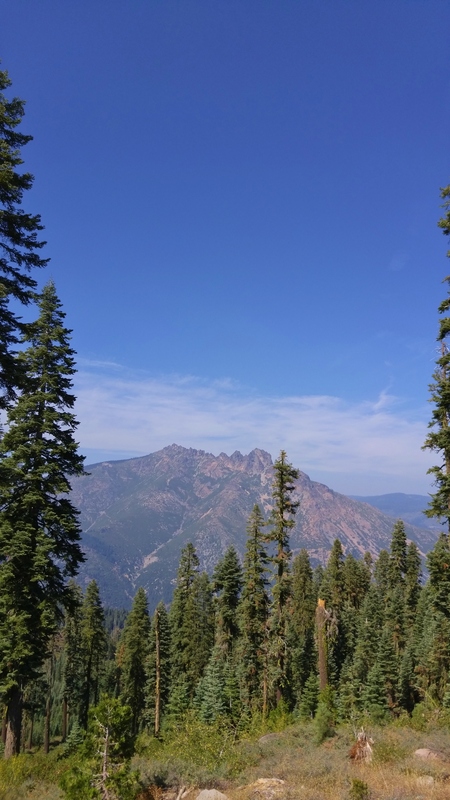 In the Sierra Nevada mountains, animals such as deer and the extinct California grizzly bear would historically find the easiest routes through the mountains. Native Americans would then capitalize on the trial and error discoveries of the wild animals and further expanded these popular game trails into regular footpaths. 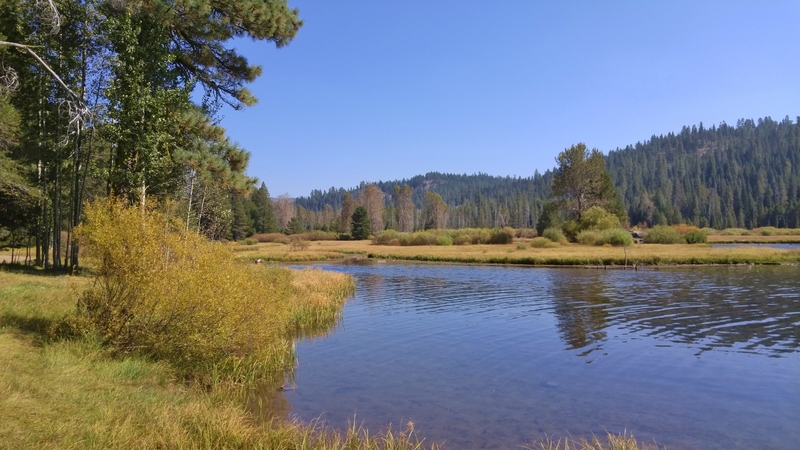 Thus, over thousands of years, fairly significant trail systems were developed throughout the Sierra Nevada mountains. 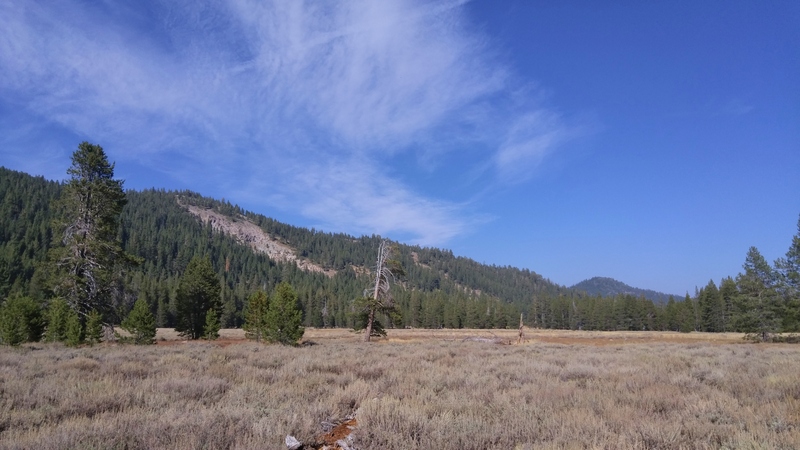 As such, contrary to the exciting myth of early Europeans pioneering routes through untamed wilderness, there were already many established trails in the Sierra Nevada mountains for them to make use of. 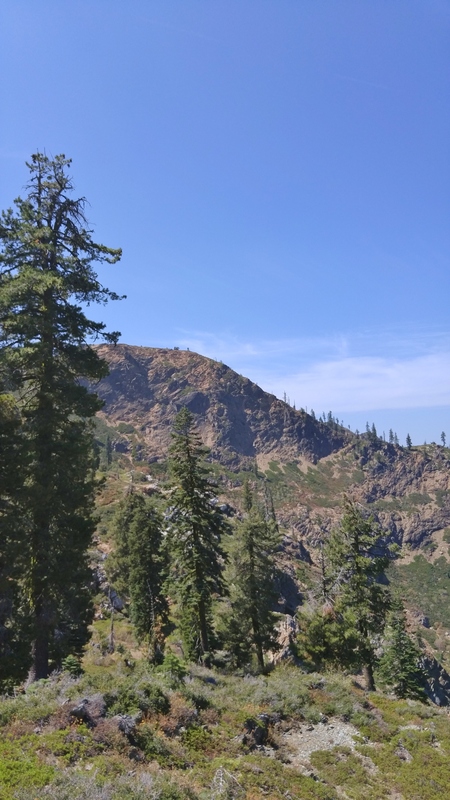 So, although there were no records kept, it is quite likely that large sections of the major routes through the mountains today – such as Interstate 80 – were originally California grizzly bear trails. 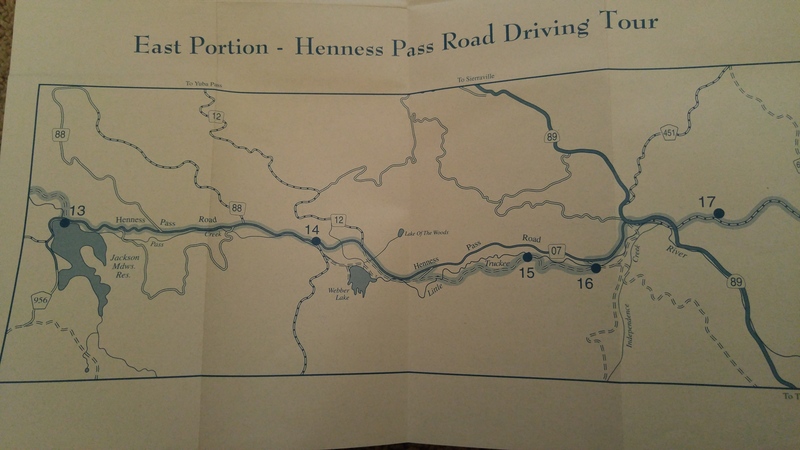 Although it is impossible to know for sure, it is also certainly likely that at least part of the Henness Pass Road was one of these ancient routes as well. 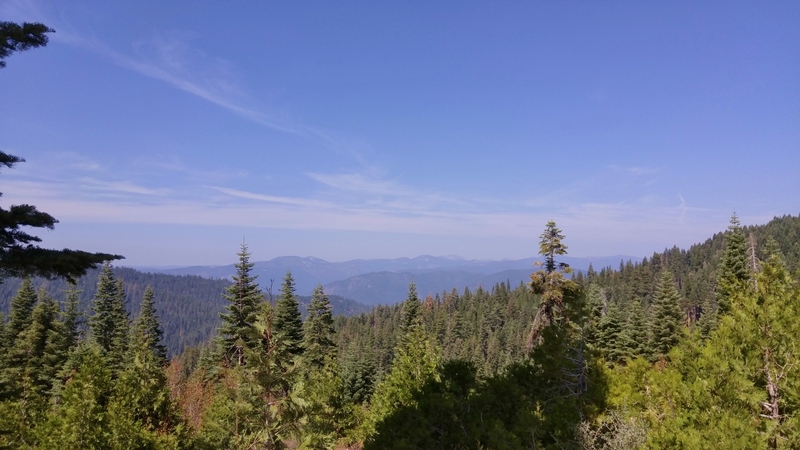 The first written record of the Henness Pass Road – then still a trail – dates back to 1849 just as the California Gold Rush was blowing up. 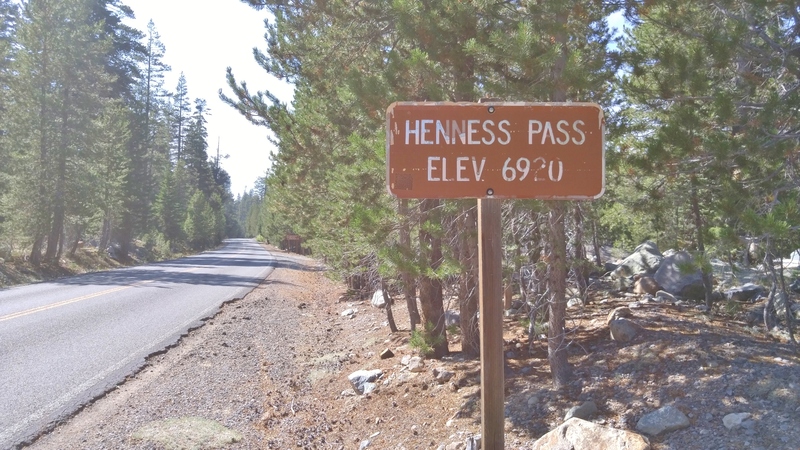 At just under 6,700 feet, Henness Pass is the lowest mountain pass through the Sierra Nevada mountains. 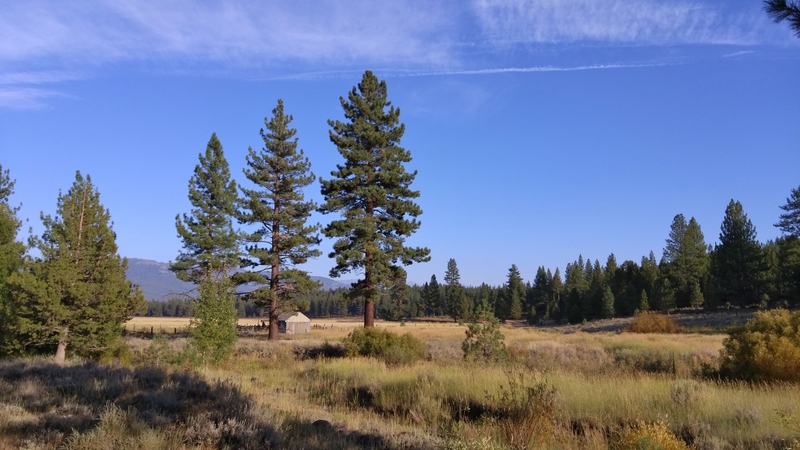 This, combined with its relatively modest grades led the Henness Pass Road to swiftly develop into a major immigrant trail for those on their way to the California gold fields. 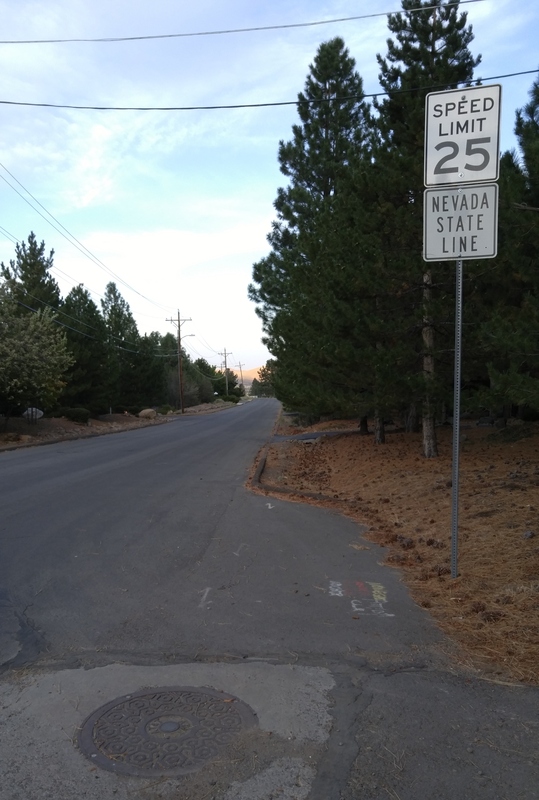 Later, after the discovery of the Comstock Lode in Virginia City, Nevada, the direction of traffic reversed and the route served as the primary supply road for the mines in Nevada. 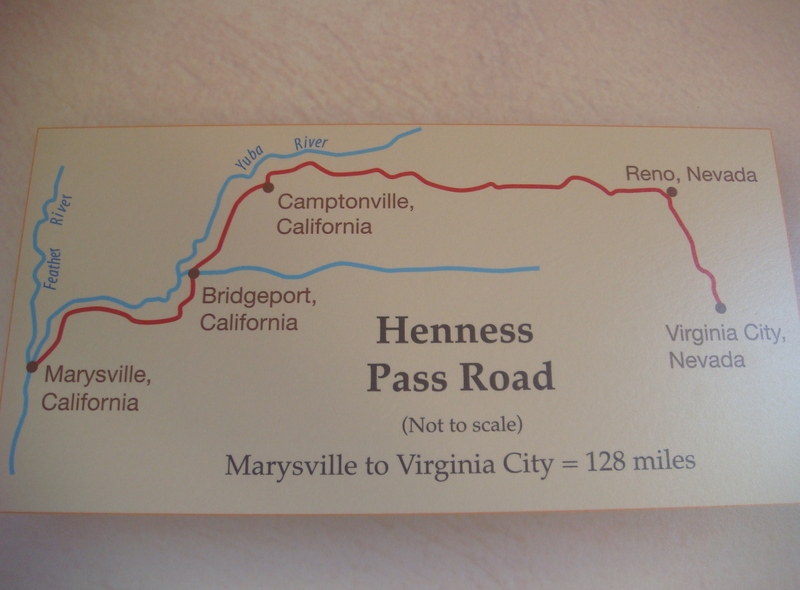 The Henness Pass Road continued to be a major transportation route through the Sierra Nevada mountains until the completion of the Transcontinental Railroad in 1869. A portion of the Henness Pass Road was later included in the Lincoln Highway, the country’s first transcontinental highway system and it continued to carry wagon (and later automobile) traffic until the completion of the last portion of the Victory Highway (later Highway 40) through the Truckee River Canyon in 1925. For additional details one can simply read the brochure at the bottom of this post. Assuming you wish to stop and check things out along the way, give yourself a day for a drive along the entire road. 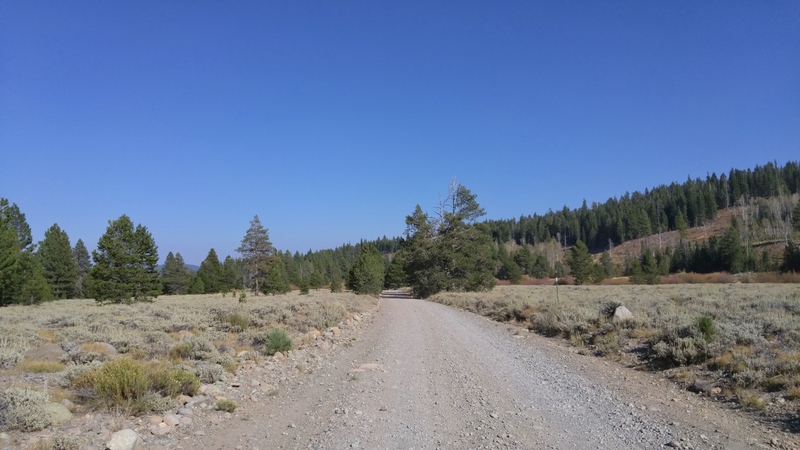 The Henness Pass Road has some sections that have been incorporated into modern paved roads and other sections that are bumpy dirt roads in the middle of nowhere. 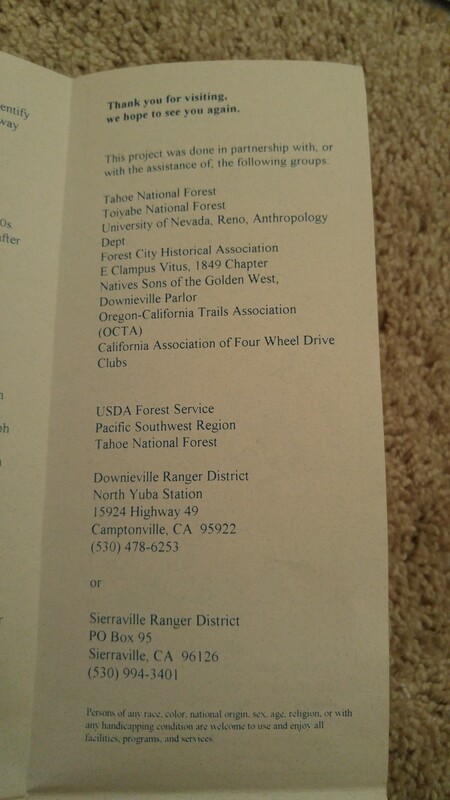 However, a 2WD vehicle can easily make the entire trip. No matter which vehicle one chooses to utilize though, fill up your tank and bring some food and water because there are no services along the way. 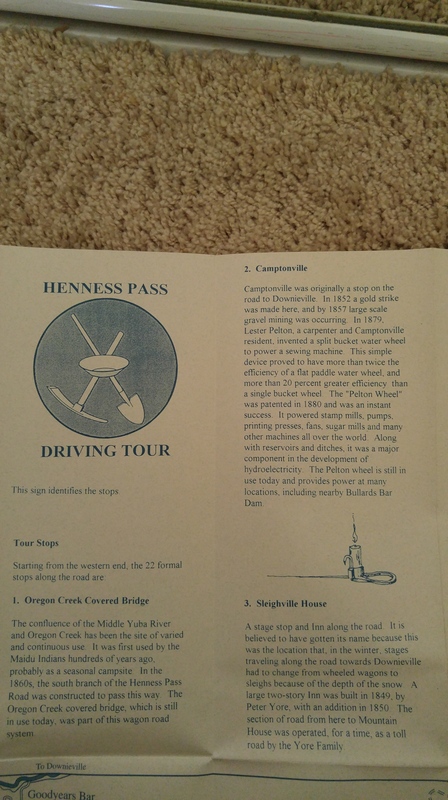 As I mentioned previously, the full Henness Pass Road brochure is displayed at the bottom of this post. 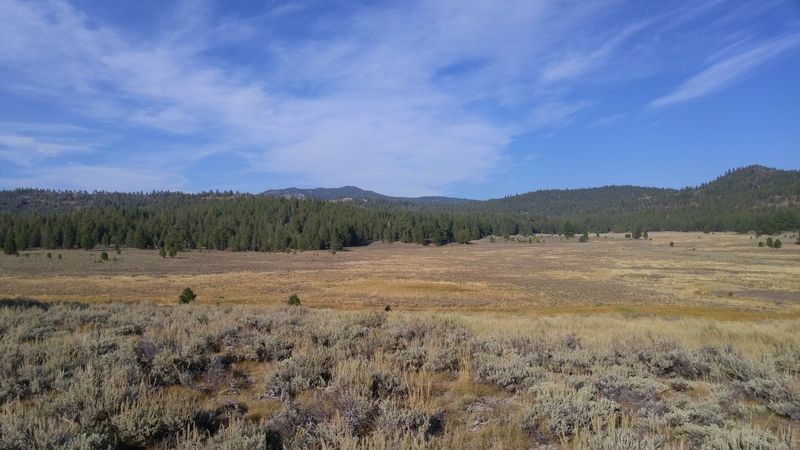 However, before that section, I have uploaded a few pictures that I took on a drive from California to Nevada along the length of the Henness Pass Road that may be of interest to those trying to imagine what this route looks like (they are posted in chronological order). 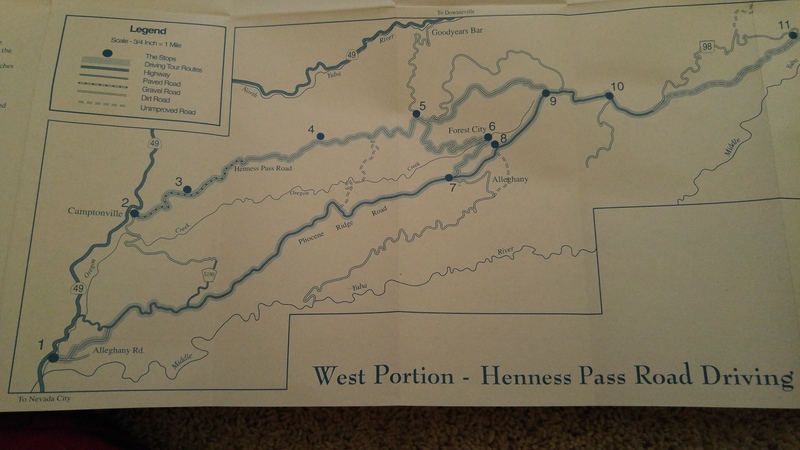 The Henness Pass Road was so crowded, in fact, that a serious proposal was made to restrict traffic during the day to freight wagons and traffic at night to passenger stagecoaches. The record travel time from Marysville, California to Virginia City, Nevada by stagecoach was 25 hours and 25 minutes. 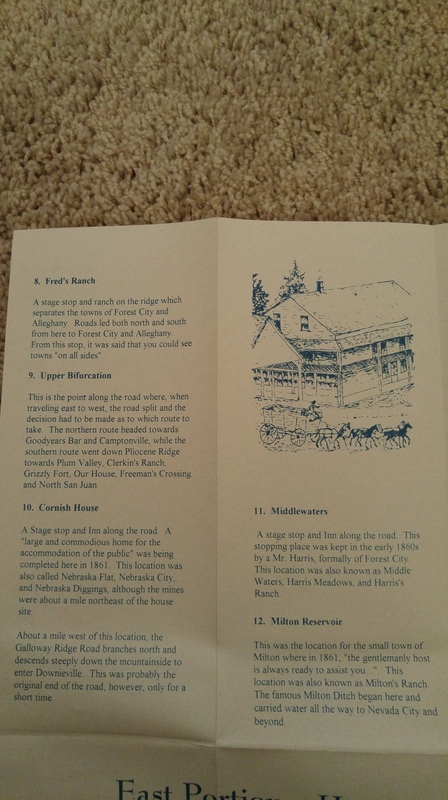 Tags: California, California Ghost Towns, Dog Valley, Driving Henness Pass Road, Forest City, Henness Pass, Henness Pass Road, Henness Pass Road Brochure, Henness Pass Route, Jim Ames, Justin Ames, Sardine Valley, Verdi. Bookmark the permalink. Nice post. Good information. 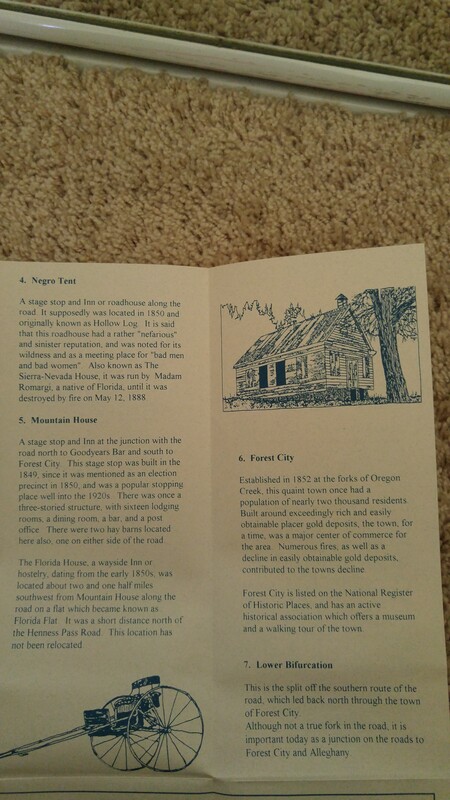 Thanks for including the informative brochure. 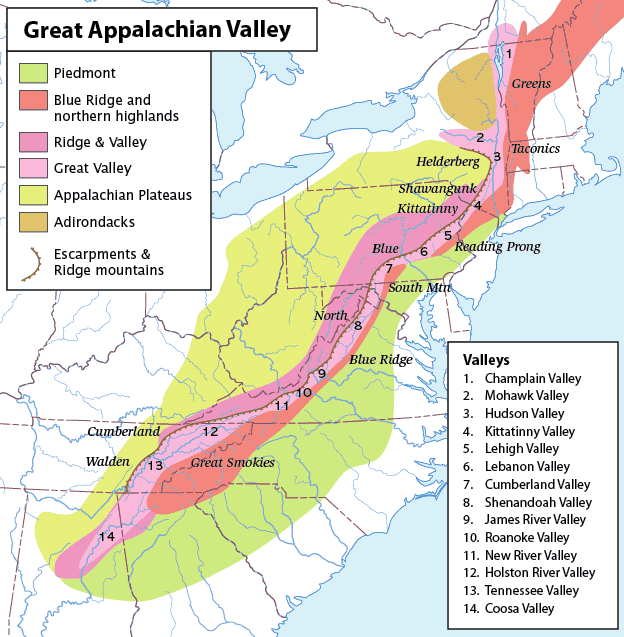 The same concept / process occurred in the East also in crossing the Appalachian Mountain range (which roughly stretches from central southeast AL through Maine and just into Newfounland, Canada. In the East, the larger, more known and used gaps – with the Cumberland Gap clearly being the best known – tended to be more likely to end up being major highways. At some point U. S. Highways, even Interstate Routes. 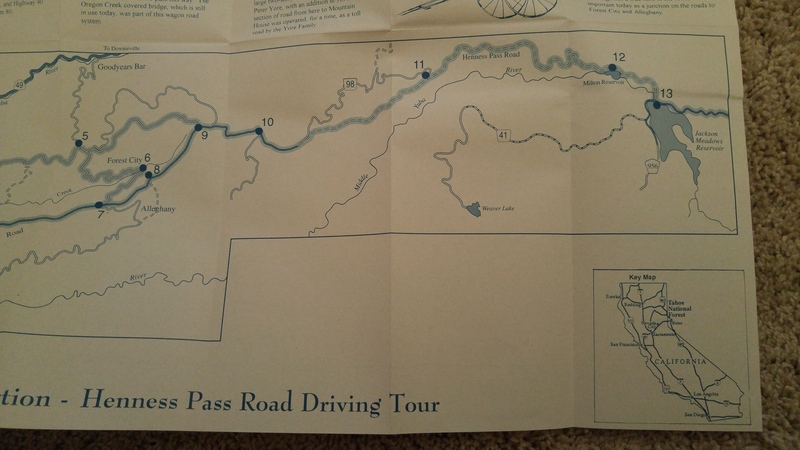 The ones in the East – 35 “Gaps’ altogether – also however seemed to have a lot more “branches” (the Cumberland Gap had several), many which became minor side roads or even just larger dirt roads and even trails. Of course other routes around the Appalachians existed. One in the form of smaller ships / larger boats down the Saint Lawrence River and then (with portaging the boats – and cargo – around rapids, waterfalls, etcetera as there were no locks or canals yet) into the Great Lakes. Basically what French explorers and later French Canadians did (however they were little concerned with settlement per se, but more so into trade). Later English colonialists and American settlers also used this route / method. In looking at Ohio, Cleveland, settled by this method, was the first settlement founded in the Connecticut Western Reserve by the Connecticut Land Company. As late as 1800, a company representative reported that only three men lived in Cleveland. Ten years later, there were only fifty-seven residents. During the 1820s, the city experienced growth due to the arrival of new forms of transportation. The Erie Canal connected the city with the Atlantic Ocean during the 1820s. During the 1820s and the 1830s, construction of the Ohio and Erie Canal connected Lake Erie with the Ohio River. Both of these canals bypassed the need to portage in using the St. Lawrence – Great Lakes route (*). Another in the process / method of traveling along the Gulf coastline and then down the Mississippi River (and further up the Ohio River, etcetera). That’s where you see Marietta (Ohio) as the first permanent settlement of the new United States in the Territory Northwest of the River Ohio. Marietta is located in southeastern Ohio at the mouth of the Muskingum River at its confluence with the Ohio River. (*) The initial Saint Lawrence Seaway – allowing passage down the St. Lawrence River and into the Great Lakes and vice versa – was preceded by a number of other canals. In 1871, locks on the Saint Lawrence allowed transit of vessels 186 ft. long, 44 ft 6 in wide, and 9 ft deep. The full route that permitted travel by regular ocean going ships did not conclude until 1959! 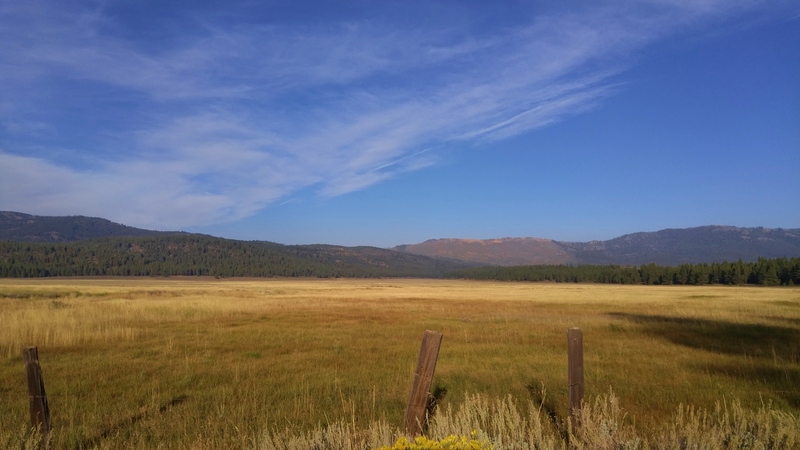 We drove the old wagon route, the Henness Pass Road, from Nevada City, CA., over the Sierras to Verdi, Nevada. Much of it was unpaved and quite rocky. 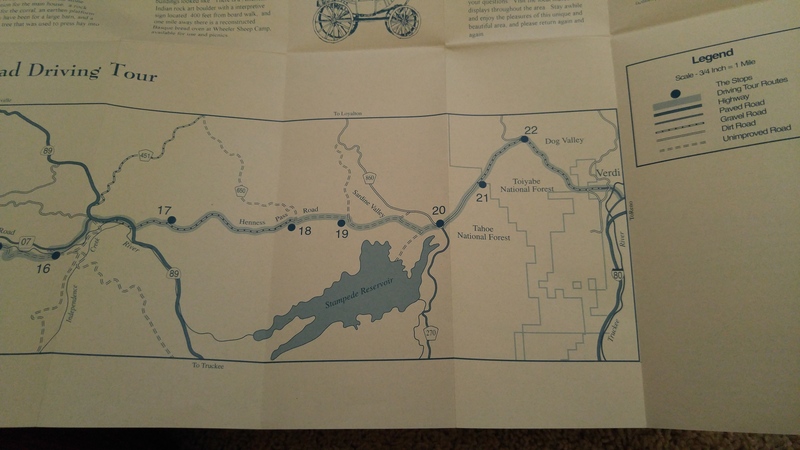 It is quite unimaginable how the ride must have been in a stagecoach or on a buckboard, but easy to understand how the distance that we now cover in about an hour and a quarter took several days. The route follows a ridge line so the scenery was quite beautiful with majestic valleys on both sides. The trip took all day and there were several times when we didn’t see another person or any sigh of human habitation for several hours. 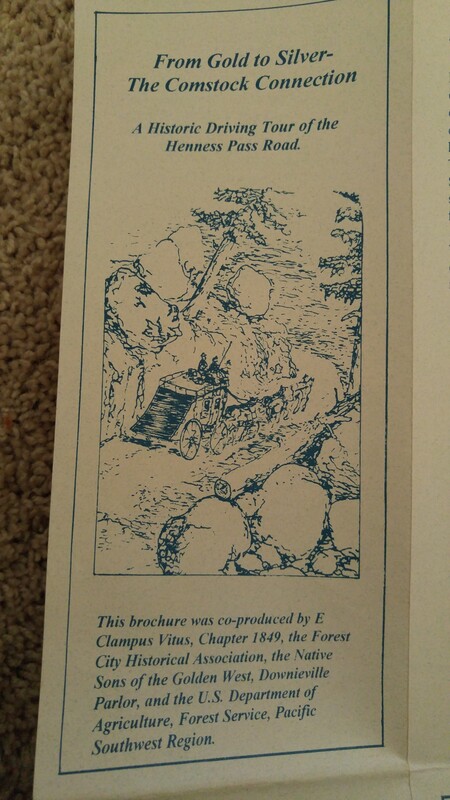 The recognized the pictures in the article; they brought back fond memories. Yes, it’s a great day trip. 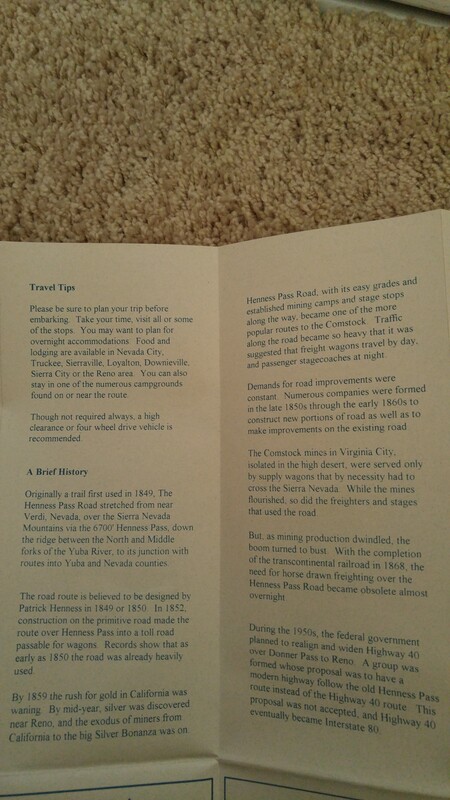 It’s amazing how few people one sees given how crowded the Henness Pass Road was in the past… And, yes, I can’t imagine making that trip in a buckboard. 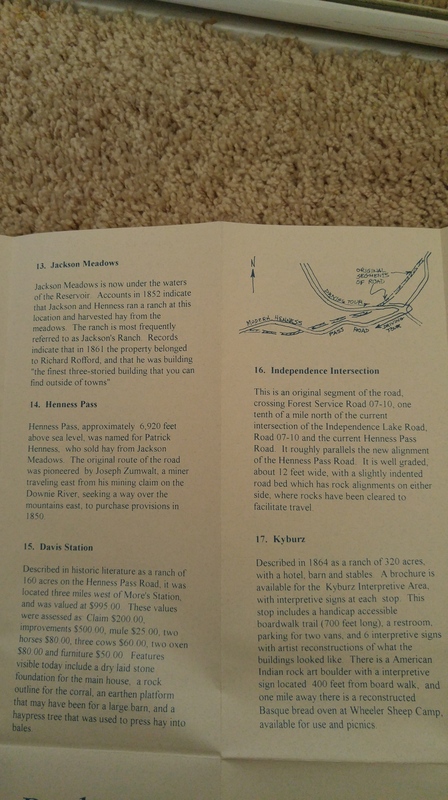 I just discovered Henness Pass road as Waze told me that was the way to get to Independence Lake. It didn’t turn out to be such a great way to get there! Right across 89 from where it goes up to Kyburz Flat, there’s a dirt road entrance with an unlocked gate. I drove down there and paralleled 89 for a mile or two until I got the sign “Road Closed – Bridge Out”. Had to turn around. 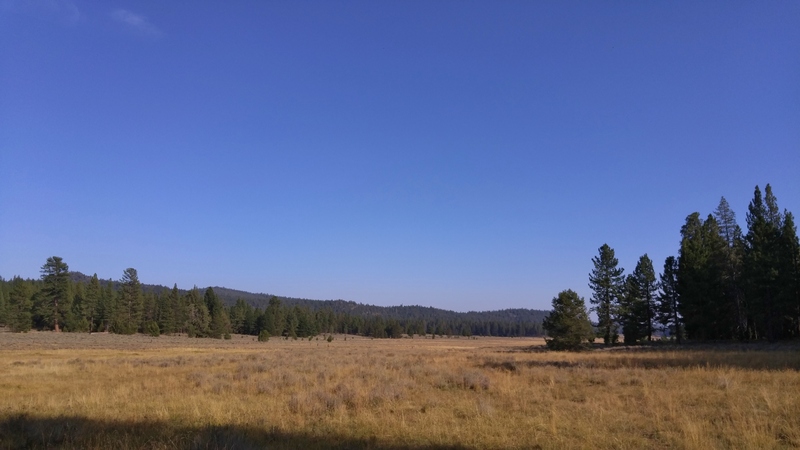 Decided to head north on 89 to Sierraville just to see what was there and saw the very obvious very paved Jackson Meadows exit to Independence Lake. Got to the lake finally, really spectacular. 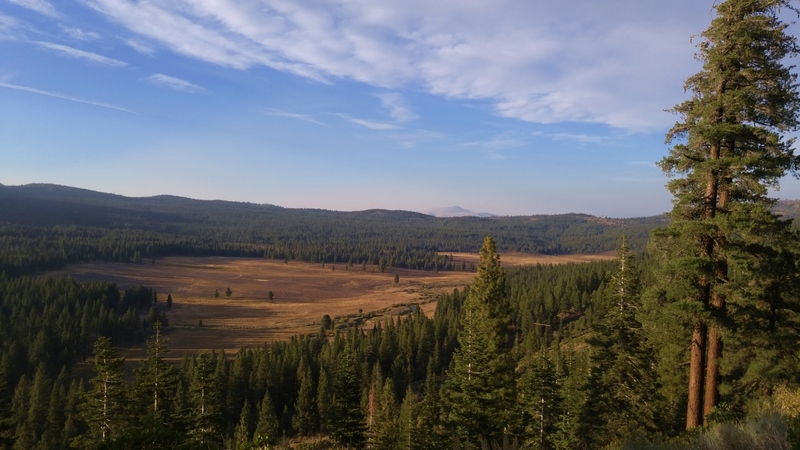 Now that I know more about HPR and where it goes I might go over the pass to Verdi from Truckee if we go there again some day.